Babylon Translator is a free Windows 8 language translator app. Using this app you can now translate text in more than 30 different languages. To name a few; Arabic, Bulgarian, Chinese simplified, Czech, Danish, Farsi, Dutch, Finnish, Hebrew, Hindi, Japanese, Korean, Polish, Russian, and many more. The app provides the fastest and fluid language translation experience. Plus, it gives you options to translate a phrase, a line, a paragraph, and also multiple paragraphs. If you ever felt the need of a language translator, or planning to go to a country, whose language you don’t know; then this is the app for you. You can get this free Windows 8 language translator app under the Tools Category in Windows Store. Also, you can use the link provided at the end of this article to get the app. Like mentioned above, this is a language translator app, and is developed by Babylon. The app is simple and extremely fast. The biggest advantage of this Windows 8 language translator app is its ease of use. It is just one screen app. So, there’s no hassle of jumping between multiple screens, and getting confused without actually knowing on which screen you are exactly on. The UI of the app is pretty clean and simple. So, there’s no disturbance at all. This makes you focus only on the text part. As stated earlier, there’s a big range of languages available within this free Windows 8 language translator app (around 33). This is one big advantage of the app. You can also swap between the languages. This helps in quickly translating the languages. 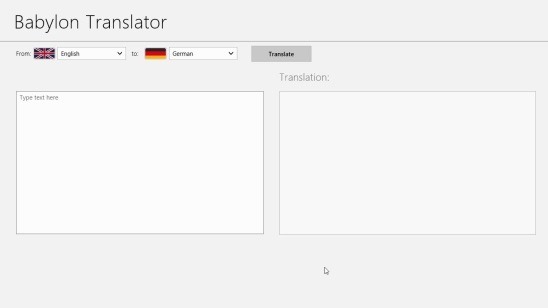 On launching this free Windows 8 Language translator app, you’ll get the Main screen. This screen is pretty well laid out. There are two labels at the top, which are From and To. Besides each of these, there is one drop down for selecting languages. Simply click on this drop down besides the From label, and select the source language. Then click on the drop down besides the To label and select the requisite language. Type or copy-paste the text in the left hand text box, and click on Translate button. That’s pretty much it! I liked the fact that both the source text and the translated text are displayed at the same screen neighboring each other. This helps you see the line by line translation. There’s no limit to the total number of words, so you can add as many lines or paragraphs as you want. Also the app supports copy-paste functionality. This makes translating texts very easy and fast. 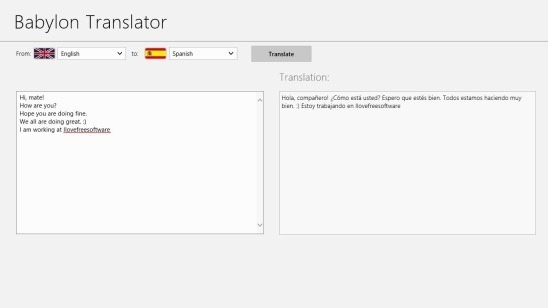 Also check out these free Windows 8 language translator apps: Bing Translator and Free Translate 2. 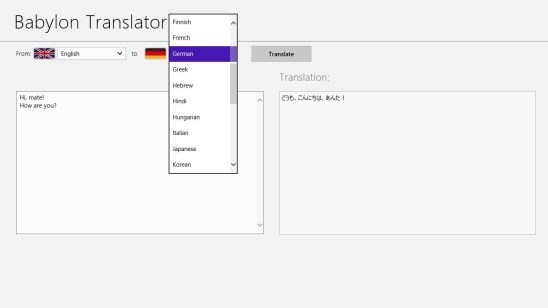 Good Windows 8 language translator app. Support for more than 30 different languages. Babylon Translator is a good to try Windows 8 languages translator app. The app is most useful for translating small sentences or the sentences we use in day to day life, but the app lacks a little behind when it comes to translating multiple paragraphs. Though it translates them, but it doesn’t translates them quite well. Still it’s quick, easy to use, and to some extent functional. Above all it’s all for free! You might also like this multi-language dictionary app for Windows 8.